I have had the privilege and pleasure of being involved with some exciting art projects within the New Hampshire Seacoast area. Below is a selection of my community, residency and public art projects over the past ten years. I would like to thank the funders, participants and staff of the organizations involved for their support of my work and shared enthusiasm for the visual arts. 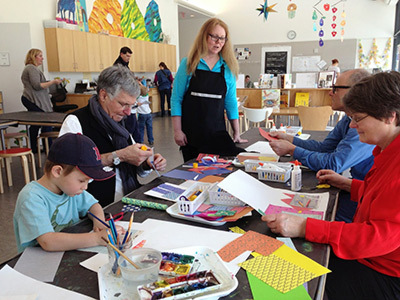 Since 2012 the Eric Carle Museum invited me regularly to hold art workshops for children (and adults!). Fun! I was also involved in the public art exhibition "If These Rocks Could Talk" in 2010 with one of my artworks. I created large scale installations for "The Mythology of Rochester" in 2012 and the "You are here" giant postcard project in 2013. I was one of six artists awarded a public location from Art-Speak, the city's cultural commission in Portsmouth, NH for exhibition of a temporary art piece during the summer of 2008. My piece was a huge banner in two parts spanning two floors of the parking garage in Portsmouth. More photos of the process and hanging here. This project was again about the process, but we were all amazed at the end products! We created paper cast masks from clay molds, which we modeled after choosing an emotion to base them on. The pictures include some of the participants with their masks which were made in a four weekend workshop at the Community Campus. They gave up ownership of their work to complete the pieces for a group sculptural work which now hangs in the Families First hallway and the computer room of the Community Campus. The Portsmouth Children's Museum 2001 "Curioius Timepieces"
I was selected to create an artwork around the prompt "Curious Timepiece" as a benefit auction artwork to support the Portsmouth Children's Museum. I created a 12x18 inch collage using family portraits and inks to show the passing of time and generational changes. The artwork was on display at the River Run Bookstore prior to the gala auction at Wentworth by the Sea. In the year 2001 I was hired by The Portsmouth Children's Museum to facilitate a program for their series to welcome in the new Millennium. It was called "Family Stories". I worked with groups of families to create mixed media paintings which incorporated their life stories. 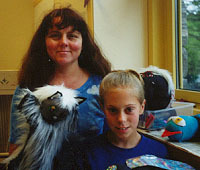 In 2000 I worked with a group of teens from New Heights program in the Community Campus in Portsmouth to make puppets and create puppet shows which they performed throughout the end of the summer for preschoolers in the Seacoast area. 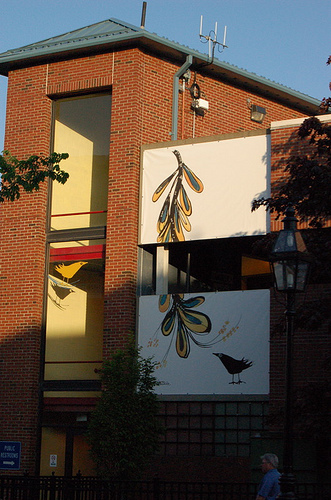 In 1997 and 1998 I was hired by the Garrison School to implement two artists-in-residence projects. The first was for the entire fourth grade. They were studying the Hopi tribe, so I wrote an art cross curriculum to incorporate both my goal of a sculptural experience with the subject of Hopi masks. 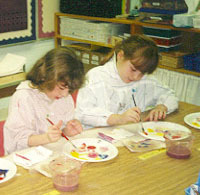 The children all made clay mask forms using stoneware clay, then cast them in paper, unmolded them and finished them with paint and other embellishments. This was a very successful project for all the children and everyone who participated (over 100 students) came out of the experience knowing more about both subjects. The second experience I had with Garrison School again incorporated the use of clay, this time with the subject of castles and their reading program. All of the students made hand-built clay castles, which were fired and then returned for finishing with acrylic paints. We incorporated some art history with the castle introduction, they learned the special parts of the castles, different types and ages of castles and then were set off on a journey to make their own design given the instructions of clay use. They not only made lovely three-dimensional pieces, but also were able to come away from the experience with a greater knowledge of the architecture of castles, color mixing theory and patience for a multi-step art experience. This project was done with the first, second, and third grade classes. The fifth grade was given the task of clay molded and paper cast Mardi Gras masks. At the end of all these projects, the pieces were put on display for the public in the Dover library as well as the display case at the school. These artist-in-residence programs were truly fulfilling for me as well as successful for the participants. 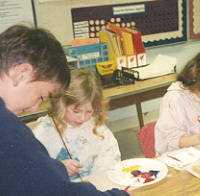 In 2000 I worked with a group of over 400 children, adults, staff and families at the Portsmouth NH Community Campus directing a project called Start with Art. This project was planned beginning in 1998 and was completed in 1999. It involved children from ages 3 and their parents, teachers, staff, friends and their families to create artwork to grace the walls of their new building. I curated the project as well as developed and ran the workshops for the artwork to be produced. It was a collaborative and fulfilling project in both the stages and the end products are still providing beauty and a sense of belonging to the building's occupants. The project began with the idea of providing the children of the community an opportunity to decorate the walls of their new library. As the art coordinator, I was anxious to work with as many children as possible to create a display for the community to enjoy. Four weekends of studio time enabled 100 children to generate paintings, drawings, paper mache sculptures, prints, collage and clay pieces. The artwork they produced created a beautiful exhibit of sixty-eight pieces, which they donated to the library. The pieces wind around the room, with the age of the artists and the placement of their work corresponding to the age and interest level of the library materials. A visitor can see the developing skills and techniques of the maturing artists as they tour and exit the room. 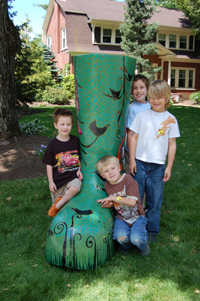 Included in the exhibit is the Art Window, which allows the children of Rochester to continue to participate. Individuals, classes and organizations are encouraged to bring flat work to place in this display.